These men's straight-fit work pants give you the mobility you need when laying tile or resetting a fence. They're made of heavyweight duck with enough flex for you to kneel or squat easily. The back pockets have a reinforced lining built with your tools in mind. Machine wash warm with like colors. Do not bleach. Tumble dry medium. Ir on with low heat. Do not dry clean. Great fit ! Finally a fit to compliment the tuff and ruggedness of the work gear. Making carhartt the go to for the next generation of working men ! I like them a lot, have wore Carhart jeans for years and these are just as good. Great fit and I like the fact the aren't baggy. I like the fit but would like to have double knees. The fact that they are not baggy like the relax fit is a plus. Perfect combo of durability, mobility, and appearance, I own three pair in the black color. Please put these and the carhartt brown color back in stock soon. The only work pants I could find that didn’t fit like clown pants on my slim frame! Durable and comfortable. Highly recommended if you prefer a slimmer fit. I had been waiting for pants like these for years. I own some of the Rigby pants and love them. 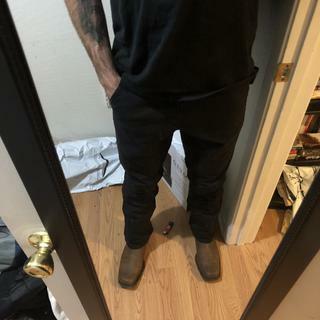 I checked the Carhartt website regularly to see if you made brown duck pants similar to those. Looks like these sold out within a couple of weeks, and I missed them. Signed up for an email alert for restocking, but then got a follow-up email that said they won't be restocked. Why?! People obviously want these because they want something other than baggy work pants. Make more so you can sell more.! Great. I like the stretch fabric. I've been looking for modern fit work pants, and these are the best I've found. Heavy duty, pockets galore, and are holding up great in the workshop. These pants are so close to perfect: true to size, amazing quality, awesome pockets, all pure Carhartt. Two downfalls: Firstly, they knot up like a straight-jacket in the dryer and take creases like you starched them in. I dry them by laying them flat on my utility room’s concrete floor. Only way short of ironing them which I’ll never, ever, do. Lastly, lose the hammer loop or whatever it it’s supposed to be. Otherwise, totally awesome pants that I wear everyday. Keep up these straight/slim cuts Carhartt. Please. Best fitting work pants on the market. Carhartt hit it out of the park with these! Rugged Flex Straight fit Duck Dungarees. These are the best fitting pair of work pants I have ever worn. In a world of wide pant legs and a baggy seat/thigh area, these are a nice change for a more comfortable fit and modern look. The Leg opening is 15.5” wide, they have a bit of flex which adds comfort, and a gusseted knee area for effortless bending and maneuverability. I did have to return the first pair since the sizing is a bit different with Carhartt. 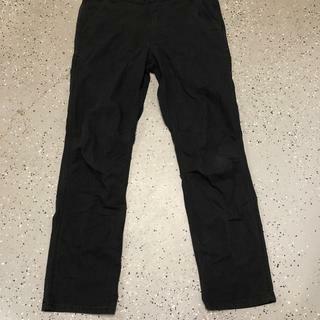 I’m 5’11”, 180lbs., and usually wear a 32”x 32” in most brands, so I ordered that size with these, but I found the waist in these to be one size too small and the length to be one size too long. I reordered in a size 34” x 30”, and the fit is perfect. Please offer more color options, these Carhartts are incredible!! These were a gift for my boyfriend and he thinks they're great. He loves how they have a slim straight leg, no bagginess. And the material is super stretchy and comfortable. Can be worn as everyday pants, very nice looking! I’ve owned these pants for about a month, and while very comfortable, I’m a little disappointed that I’ve already got holes from wear (not tear). These pants are true to size. I normally wear 34x32 but needed 34x34 in these compared to other straight traditional pants. They are stiff at first but break in after a couple of washes. Only thing I wish Carhartt would do is make a 14" leg opening instead of 16". Sometimes they can give the bootcut look due to the pants being slimmer in the thigh and knee. If they made a 14" leg opening in the straight traditional fit they'd be THE perfect pair of pants. Also more colors! Amazing fit and comfort - they are more comfortable than my most broken-in jeans. Nice bit of stretch. No "elephant legs" - nicely fitted, but not tight. Only possible complaint is that I'd like to see the fabric be a bit thicker and more durable feeling. We'll see how they wear, but they're thinner than the duck fabric that my Carhartt shorts are made of. One more thing - more colors, please. Extremely comfortable pants.. durable with just enough stretch! I normally wear a 31x32 in another brand, and the 32x32 in Black fits great with no belt. Really excited to use these on the job site! These have a great tapered fit, that loosens up just enough in the calf for work boots or western boots with no flair. Killer! Best work pants I've ever had! These are easily the best work pants I've ever had. The are super durable and have just enough stretch. And I like the fit of these pants so much more than any others I've had. I have never been able to buy traditional work pants because they all looked like clown pants on me (I don't have the largest legs). Because of this, I was ruining all of the jeans. These pants are by far the best work, and everyday pants I have ever owned. I am buying another pair to wear outside of work. FINALLY a great pant! I have been looking for a pair of slimmer fitting work pants for awhile now since I have toothpicks for thighs. Upon receiving these I was pleasantly surprised at the fit and comfort. If Carhartt adds more colors of these pants I will buy them all. Not only are these great for everyday work they have proven perfect for rock climbing and other activities that require durable materials. I was pleasantly surprised when I received these pants. Normally I have to size down in Carhartt due to the fit. The Straight Fit Duck Dungarees are a very athletic fit. I really love the fit. The knee of pant is stitched tucked to give knee a tapered look. The feel of these pants have more of a comfort worn feel and not the normal firm feel. I would warn those who are looking for more of the classic fit, these pants are not. They have more of a slim fit design and feel true to size so I ordered my normal size and I actually like them. As I said normally I have to size down but the straight fit absolutely is a nice fit in my opinion. These are the best fitting pants I have ever had from Carhartt. They fit like they were made for me. Plenty of room to move, but not baggy like most work pants. They look great on me. I love the new flexible duck material. They feel plenty durable, but comfortable as well. My only suggestion to Carhartt is they offer more color options, I would love to see Mushroom in these pants. Hopeful when I ordered these pants online. Upon their arrival I was not let down. excellent fit, super comfortable, and hold up well. I will be buy another 2 pairs soon. Have these pants been discontinued? I wear size 30x30 and I have not seen it in stock. BEST ANSWER: This style is not discontinued. We are expecting to restock these on or before January 2020. What’s the leg opening for size 40 pants? BEST ANSWER: The leg opening for a size 40 is 17 1/8th inches. What’s the leg opening on 42 30? BEST ANSWER: The leg opening for a 42" waist is 17 1/2". BEST ANSWER: They fit over my lace up work books just fine. I beat the hell out of these things in a fab shop and they have proven themselves time and time and time again best pair of pants I have. I have a pair of arctic pro muck boots and they do not fit over them. I have a pair of shorter/smaller timberlands and llbean boots and they fit over those just fine. I usually wear a size 31 waist in regular fitting pants. Will I have to size up (32) because of this slimmer seat area. I notice when pants get that “slim seat” the same size waists akways seem tighter. Is this something I need to account for? Should I size up? BEST ANSWER: We would recommend going with your actual waist measurement. How much do they shrink in length? I’m a 29x30 and you guys only have a 30x30. Do these fit true to size? BEST ANSWER: Yes, these do run true to size. What size are the leg openings for the rugged flex straight fit dungarees? BEST ANSWER: The leg opening varies depending on the waist size. In a 34" waist, the leg opening is 16" around. How do these fit compared to levi 513? BEST ANSWER: Very similar fit in the thigh, but the taper is just a hair wider in the calf to allow stretch over work boots or western boots (without making some weird bellbottom type of flair). The duck material feels much stronger than the denim in the 513s, and is a bit thicker. The stretch is similar to the 513s. Overall a slim taper combo of the 513s and 508s. Great pants! I would say they fit more like Levi 514's Straight fit. The fit is more of an athletic cut in my opinion.